Basic settings for landscape photography. How to shoot a panoramic image. How to shoot a stargaze image. How to shoot a star trial image. How to shoot sunrise and sunset. Making use of ND & Polarizing filters. How to make use of your camera’s built in self timer. How to use a wireless remote. 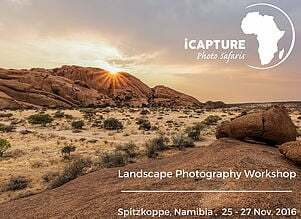 To make your booking visit the ICapture website or email them at icapturephotosafaris@gmail.com. You can also follwo them on Facebook, Twitter or Youtube.